Recent Fatal Crash Prompts Action To Fix "Deadman's Curve"
Last week, two drivers were killed in yet another crash that occurred on the deadly stretch of S.C. 9 in Chester County, suitably named “Deadman’s Curve.” Now, the deceased truck driver's family and Chester County officials are asking the South Carolina Department of Transportation to take steps towards making the road safer. The deadly curve is located about 10 miles west of Chester and over the years several fatal crashes have occurred in that exact location. The latest incident occurred March 7, when a van crossed the centerline while rounding the curve and hit an oncoming logging truck head-on. The impact caused the van to explode in flames and incinerate parts of the logging truck. Both drivers were killed as a result of the crash. Now, the family of Clyde Mike Davis, the logging truck driver who was simply doing his job when he was tragically killed, has come forward with a public plea to improve the highway. They are asking the state to have traffic engineers examine the area to see if anything can be done to make the road safer. “We were all devastated; it happened so fast. My brother’s death was so unexpected,” says Ann Caughman. The van driver, Jacky Blalock Jr., 51, also died at the scene and investigators have not yet said what caused him to veer into the path of the logging truck. Chester County officials are behind the family and asking the state Department of Transportation to perform a traffic study. County Councilman John Wayne Holcombe is a former sheriff and police officer that has lived in the area for forty years and says there were at least six fatalities or more during his time as an officer. “We would like to know if the road can be widened, straightened or something,” says Holcombe. 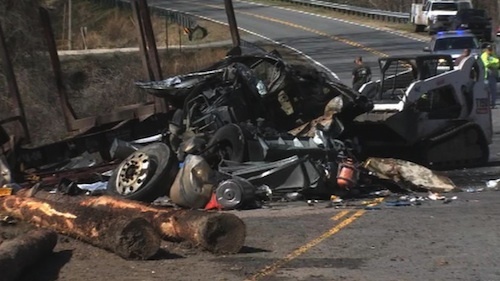 Shane Stuart is Chester County Supervisor and says he can also recall at least four fatalities on that stretch of S.C. 9 during his time working with a rescue squad. “York County, Lancaster County, they have asked state officials to look at road problems like this in the past. We need to make sure that roads in Chester County are being reviewed for safety by the state,” Stuart adds. Stuart also confirmed that on Monday, the Chester County Council is scheduled to discuss and possibly vote to formally ask the DOT to study vehicle counts, crashes and fatalities there. Members of Davis’ family also plan to attend the meeting to support the safety study.